We spend a lot of time at our desks, but for some reason, decorating them is always our last priority. What would happen if you trudged in one morning to see a comforting home-away-from-home instead of a drab manilla-folder-filled space? I set out to create the coziest cubicle in the hopes of inspiring more creativity and making myself (and my coworkers) more relaxed at work. It may seem obvious, but when choosing a color scheme, just stick with your favorite color! For that mental and emotional pick-me-up, a favorite color instantly soothes, and pale shades put your mind and soul at ease. Here are a few picks from the color experts; see which one speaks to you! Green I chose a watercolor-y shade of green because it’s reminiscent of nature and therefore very grounding and soothing. (Not to mention, that sea-foamy color just happens to be my favorite!) It is also said to inspire creativity, harmony, decisiveness and action. Money talks. Green also denotes security, growth and prosperity. Blue might be the top pick for a workspace. It’s calming and boosts creativity. It helps with concentration and can even slow the heart rate. In a busy work environment, blue can create a sense of privacy and also symbolizes honesty, wisdom and confidence. Lavender is also very calming and creates balance. If you deal with a lot of dualing personalities at work, a light shade of purple might be the one for you. It is also known for calming chaotic or high-stress situations. Pink brings peace and calm into a room and helps tone down the energy. Red Check those disagreements at the conference room door. Red can be overstimulating, stirring up anger and hostility. No thank you! Grey can be very soothing but could also cause a lack of confidence, depression or low energy. Pass! Anything too patterned or bold Just distracting AF. Is there anything more jarring than those dizzy fluorescent lights? While they might be hard to avoid in a big office building, it is possible to shut ‘em off. Just pull up a (stable) chair, unscrew the bulbs inside (Careful! They could be hot!) and enjoy the natural light from your nearest window. 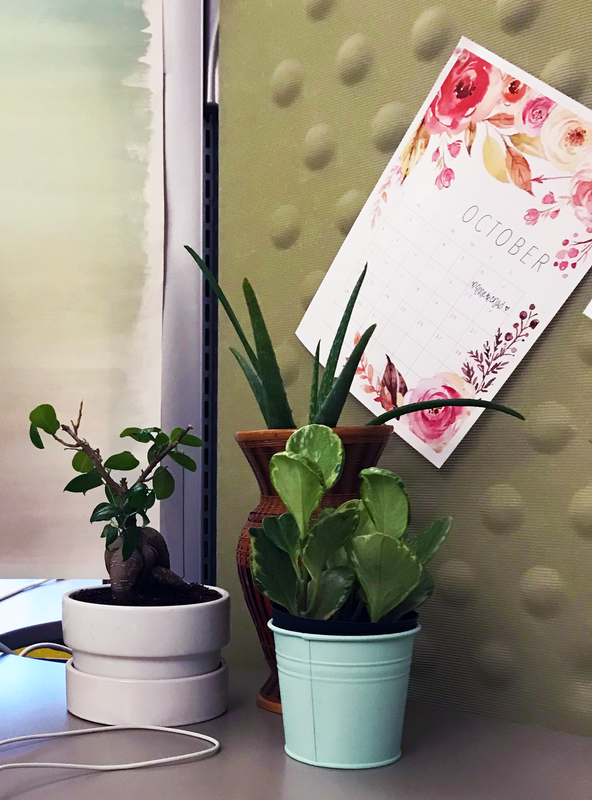 We’ve already talked about how green’s association with nature is soothing, and there are a ton of benefits from having plants in your workspace - i.e. clean air, stress and noise reduction, and increased creativity & productivity to name a few. But with so many plants to choose from, where do we begin? These indoor plants have both functional and symbolic benefits. Bamboo is said to attract abundance and prosperity, almost like an instant “hint, hint” to your boss. They’re also really low-maintenance and don’t require any sunlight. Aloe Vera removes toxins in the air and has a ton of healing properties. It’s a natural moisturizer too, so you can ditch that tube of lotion. Warning, it needs a lot of natural light, so if you are buried in an aisle, you might want to choose another. Snake Plants improve air quality by filtering formaldehyde, trichloroethylene, xylene, toluene, and benzene from the air. And they are easy (really easy!) to take care of. Succulents (duh), fun and low maintenance. If you really want to go big, have some fun with your your coworkers by creating your own terrariums, where you can even house some crystals. Are oh-so-cool looking (especially this disco one), and they also attract air pollutants, neutralize the effects of electronics, boost mood and energy, increase focus and are even said to combat allergies. Not feeling salty about this one! Add a cozy chair and rug to make your office feel comfortable and welcoming. A magazine rack is a more stylish way to display office supplies, and you can also use it to show off some of your favorite pieces of work. Make the backdrop of your computer screen your happy place to remind you of what you’re working for and to keep you motivated when you find yourself in a slump. Ahh, now kick your feet up and revel in the abundance and creativity coming your way! I replaced one of my walls with a tapestry! How casual is your office?